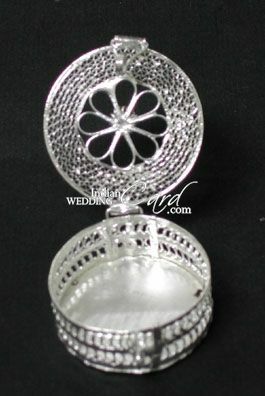 German Silver box: A miniature German silver box with the unique jali work design. Useful for a variety of uses it proves to be the best combination when you also intend to give a miniature German silver coin encased in this. Narrow the favors you like and order for samples. You pay actual cost of favor plus shipping charges. Delivery within 3-5 days. Favors are made to order and have a delivery schedule. So they are delivered at your doorstep in a stipulated time. Well packed and as perfect as you wanted.